Anthem has a very dedicated PVE branch that has a lot of opportunities for learning and growth. Our veteran trial team was started by @Americanfunguy and @GoldenKitsune in March 2017. The Red Army is designed for people who are getting their feet wet in endgame content and is beginner friendly. This is a great way to learn all the Craglorn trials on regular vet (with the exception of Sanctum Ophidia) and get a chance to get gear from DLC trials on normal. Crimson Guard, a subset of Red Army for clearing vet DLC Trials and Craglorn HMs, was started by @cicisch and @StoicSunbro in January 2018. 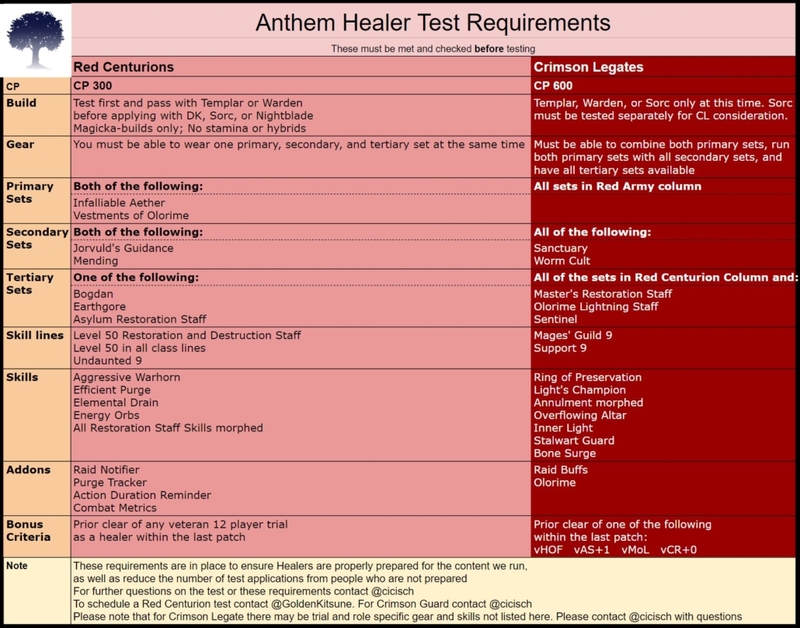 Crimson Guard is for more experienced players who have been with Anthem for a period of time and have shown dedication to trials and have grown in their roles. More experienced players who are new to the guild may also join after a few trials with Anthem. Lastly, Anthem currently has one active core team,What Vitality, led by @darkspawn27 and @cicisch. CCH has cleared vMoL, vAS+1, all Craglorn HMs and vCR+0. Anthem’s first core team, ERP Casuals, also has cleared vHoF. To apply for the team, you can either post a parse (requirements are below) in Anthem’s Discord or PM it to @cicisch. 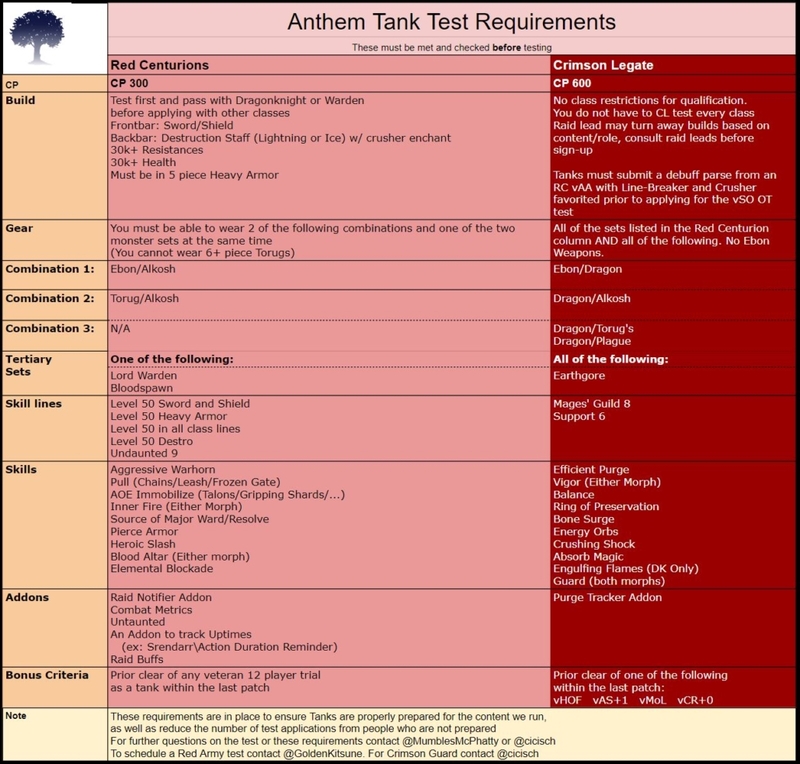 Tanks or healers should sign up for a test in #testing-information in Discord or PM @GoldenKitsune. Crimson Guard: Saturdays at 3PM EST and Sundays at 1PM EST. Red Army: Mondays at 8PM EST, Wednesdays at 9PM EST, Thursdays at 8PM EST, Fridays at 9PM EST, Saturdays at 11AM and 1PM EST, Sundays at 11AM, 5PM, and 8PM EST. Ranged and melee must now both meet 28.5k self buffed on a 3m dummy. For Crimson Guard a parse must be submitted of atleast 43k on a trial boss, done in an anthem raid. Applicants may be required to also run Veteran Bloodroot forge HM at the request of an officer.